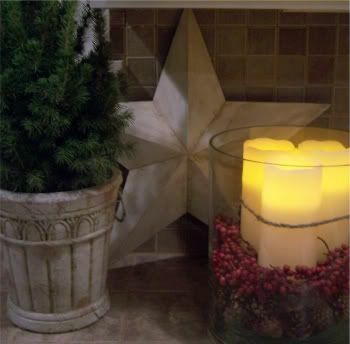 I finally finished decorating the family room…yeah (where are those elves when you need them?) 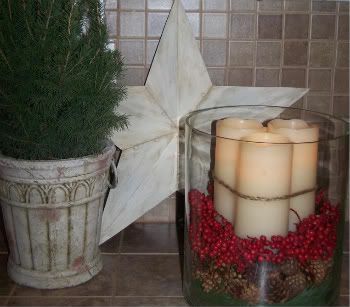 I am now working on making my kitchen a bit festive. I like to keep my counters somewhat free throughout the year ~ I usually go for plain, simple and clean as it helps keep me organized. However when it comes to holidays I always make an exception. 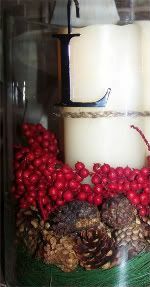 Here are two very simple and easy projects I used to start.Many of you may have seen the centerpieces I used in my Thanksgiving Tablescape. I *love* huge glass hurricanes. They are one of my favorite necessary pieces. They have so many uses and come in handy for any event or holiday. 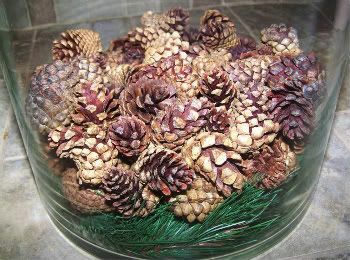 I have used them for centerpieces, party snacks, and even to hold punch for a party, just to name a few. They are a must have! The bigger the better! 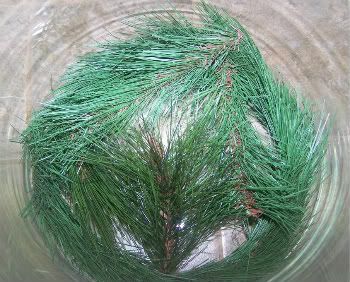 I started by collecting some random things from my stash; pinecones (from Thanksgiving), pine garland and some spray cuttings (extra pieces), and some red canella berries. 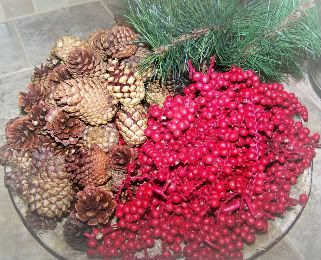 and finished with the dried berries. 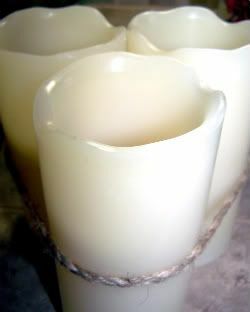 Since this piece will be sitting on the kitchen counter underneath my cabinets I chose to use flameless pillars so that I can still enjoy the ambiance of the candlelight but not have to worry about an open flame. I took three pillars and tied them tightly with some extra braided twine I had left over from my secretary project. Once they were bound together I was able to stagger them just a bit (tying the twine very tightly allowed me to do this and have the candles hold in place. Since they will be sitting on top of the berries the staggered bottoms will not matter. Plus this allows for easy removal to turn the candles on and off. Pretty simple, very easy, and festive ~ Plus I used what I had to make it even better! 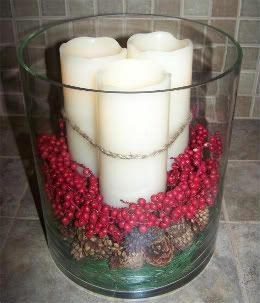 To finish, I added a monogram candle charm to the glass hurricane ~ love initials. 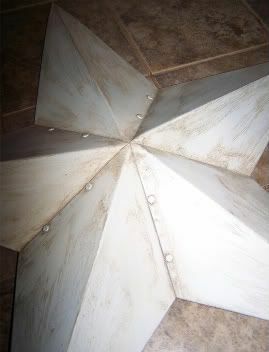 The next quick project is this barn star. It has seen its day being outside and such so it wasn’t in the best shape. I gave it a quick coat of Rust-Oleum Heirloom White. I am not a huge fan of glaze (I know, I know) so I used acrylic paint to distress. The color is 2608 Country Tan by Apple Barrel. 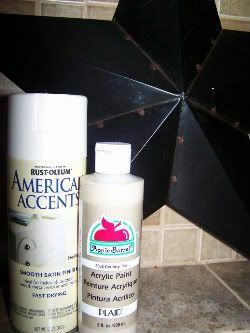 I like more brown in my distressing and using paint gives me a little bit more control not to mention you can pick up acrylic paints for less than a dollar a bottle, some even 59 cents on sale. I used a dry brush technique to apply the paint in sections then wiped with a cotton cloth. I love both of those ideas! I have a brown star like that, but couldn’t find a place for it. Maybe I should paint it? Thanks for the thought. I love the hurricane too. That is a simple, yet beautiful decoration. 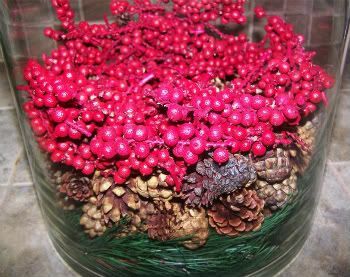 What a beautiful and easy arrangement! I am in love with it’s simplucuty! That’s what makes it so charming! Thanks for linking! What great ideas. The hurricane looks very festive and I bet at night it’s very pretty with the candle light. Great transformation of the star. It really works well in your space. What a lovely hurricane you made! All of the pieces work so beautifully together too. Simple, serene and so pretty. Love it!